When there’s a country as beautiful as Vietnam, it would be a crime not to visit. The natural beauty is breathtaking, the cuisine is mouth-watering and the history found in every town is both compelling and humbling. 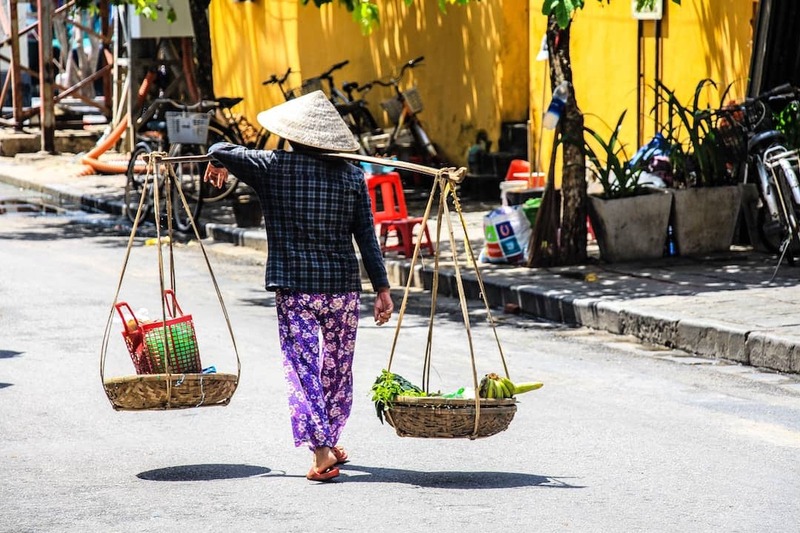 Read on to learn more about this incredible country and see if you should visit Vietnam. What kind of traveller is Vietnam suited for? 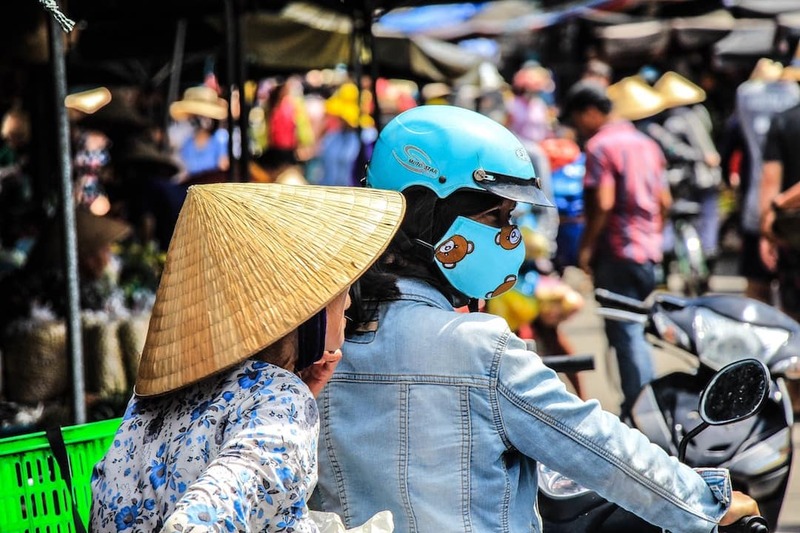 Vietnam is an extremely diverse destination, and you’ll often find that your own reasons for wanting to visit Vietnam will be completely different to others. For nature lovers, the beaches and famous landmarks such as Ha Long Bay will be the biggest attraction. For the foodies, Vietnam is a destination where your taste buds will be forever grateful. From phở to bánh mì, exploring the local food scene is an absolute delight. What’s more, Vietnam is incredibly inexpensive which is great for budget travellers, but also a perfect excuse to splash out more on luxury hotels where they are available for a better rate than in other parts of the world. Most nationalities will need a visa to visit Vietnam, usually obtained by filling out an e-visa form before you travel. Visa legislation is always subject to change, so always check with your embassy before you travel. There is no simple answer to determine when you should visit Vietnam. 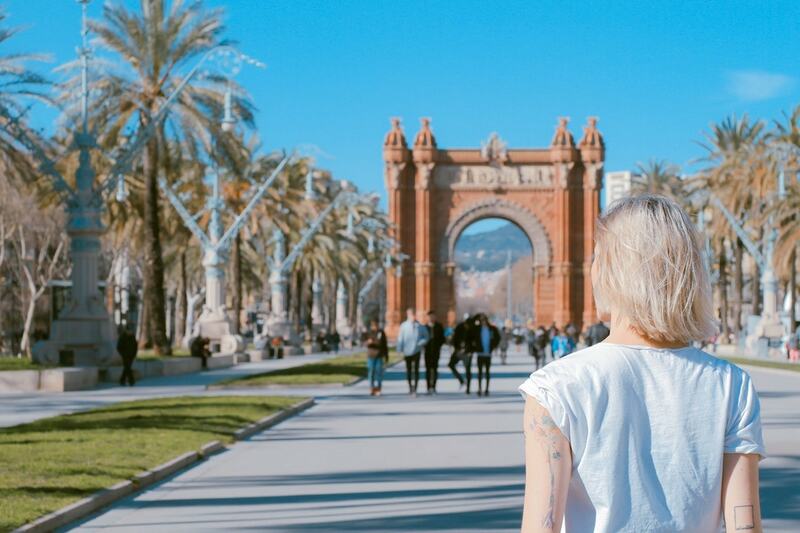 It largely depends on where you want to travel, but the following points can help you make your decision. The dry season is from December to April. The wet season is from May to November. Most downpours are very brief and as the weather is so humid, so this season shouldn’t put you off travelling here. The temperature rarely drops below 20°C in the daytime and reaches up to 40°C in the hottest months from March to May. The wet season is from November to December. Typhoons are likely to hit the central coast anytime from August to November. The best time to visit this region is in the spring from February to May. Note, June to August is very humid, with temperatures up to 30°C. Summer temperatures can reach up to 40°C from May to August, however, summer is also the rainy season, making it very hot, sticky and wet. The northernmost mountains offer cooler temperatures between December to February. Our absolute highlight from spending 7 months riding our motorbikes 12’000km around Vietnam was the town of Phong Nha. 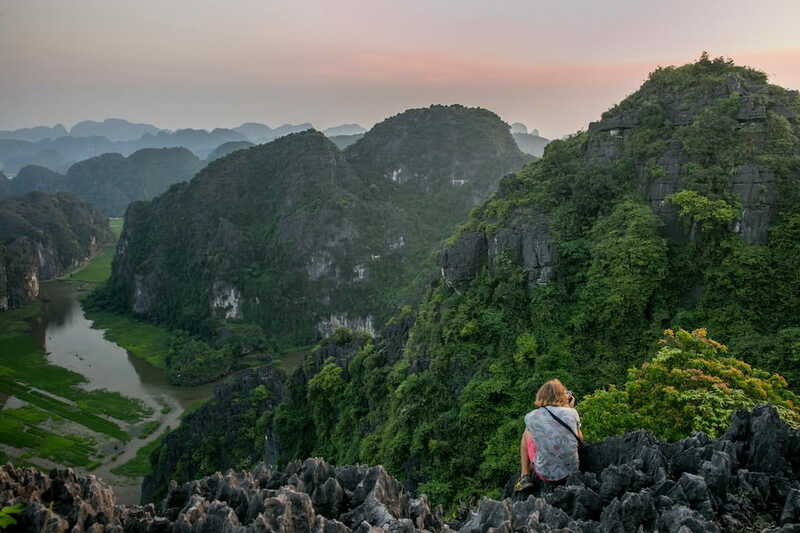 This gorgeous, bucolic village is home to stunning limestone karsts, friendly people and captivating scenery, but it is best known for being the location of the Hang Son Doong, the world’s largest cave. Besides Son Doong, Phong Nha has a collection of other spectacular caves that are accessible to anyone with an adventurous soul. Of everywhere we travelled in the country, Phong Nha is by far the best place. How much time do I need in Vietnam? You should spend at least two weeks in Vietnam to enjoy the main sights, but if you also want to go more off the beaten path, three weeks would be ideal. 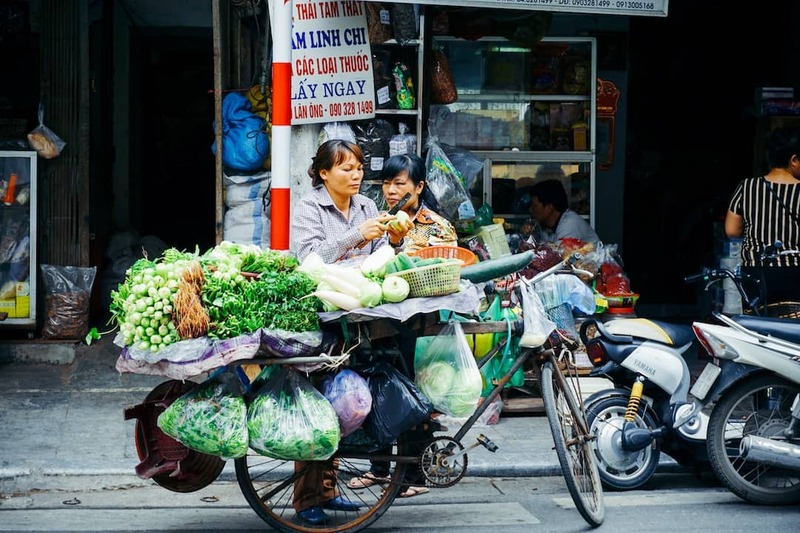 Vietnam is a long, narrow country so travelling internally means navigating a few of the local transport options. For any longer distances, and if you’re short on time the best transport option would be to fly. There are a number of safe, reputable airlines that operate in Vietnam. If you’re looking for cheaper travel option, buses are a good way of getting from A to B but are often very busy and not overly comfortable. Some sleeper buses can be surprisingly comfortable and save you a night’s accommodation but just depends on your comfort levels. As for trains, especially the Reunification Express, is much more comfortable and reliable as a transport option but slightly more expensive. Within larger cities, take a cyclo or motorbike taxi to get around. Spending time on the water is also a must-do in Vietnam, especially to see Ha Long Bay and travel along the Mekong River. Is Vietnam safe? 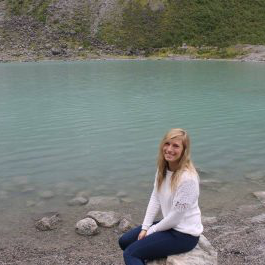 Should I travel solo? 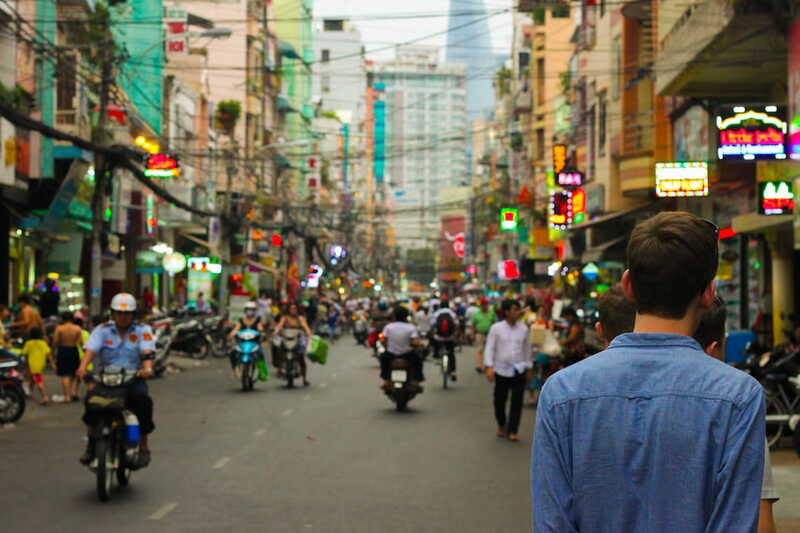 Vietnam is a very safe country to travel in and frequently shows up in lists of the best places in which to travel solo. In Vietnam, be careful of the roads, as reckless driving can cause accidents, and be aware of scams, as tourists can often be easy targets. 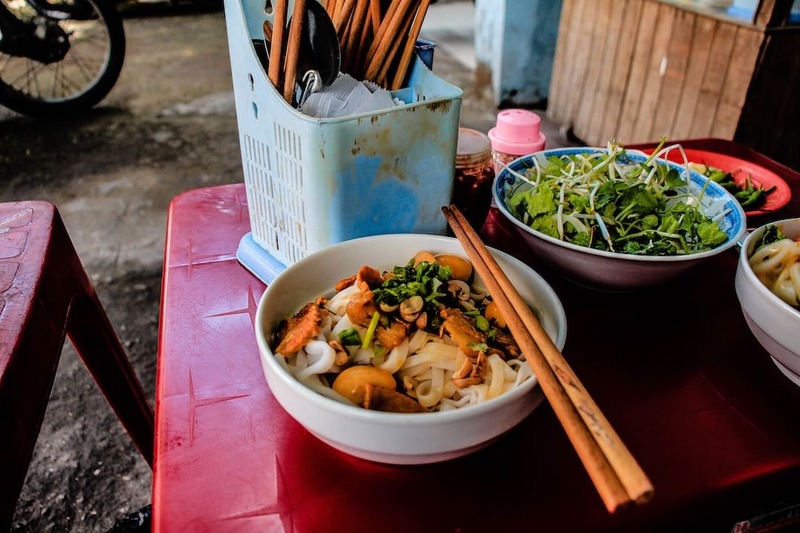 Whether it’s phở (a traditional noodle soup dish), bánh mì, (a type of sandwich), gỏi cuốn (transparent spring rolls) or bánh bao (steamed buns), searching for the best of Vietnam’s extremely flavoursome food is a highlight. The best way to experience the Mekong is to hop on a boat and travel through the peaceful, narrow waterways. Peer into stilted villages, rice paddies and visit floating markets. With white sand beaches and blue water, Vietnam is home to beaches that easily outshine the likes of Thailand or Indonesia. Check out Phu Quoc Island for idyllic beaches and diving. Han Son Doong is large enough to fit a skyscraper inside it and even has its own weather system. Located in Phong Nha-Ke Bang National Park, you can visit the cave with a permit. 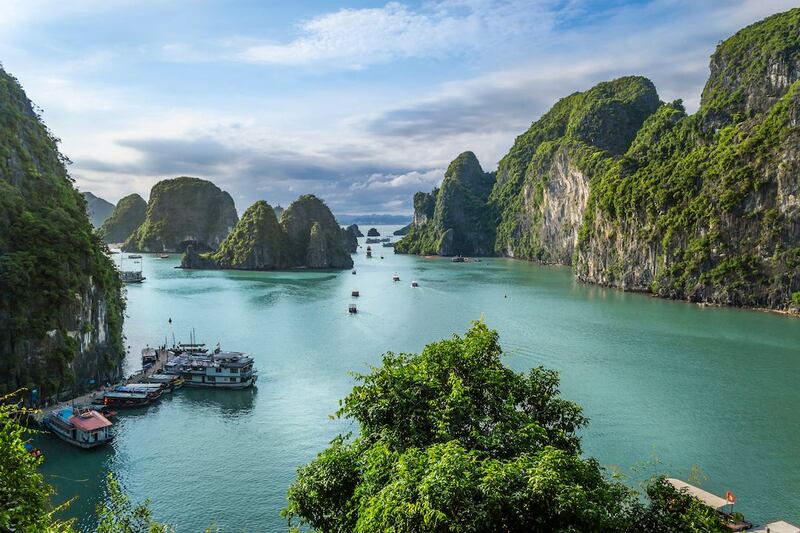 Known for its emerald water and towering limestone karsts and islands, an image of Ha Long Bay is probably the first image that comes to mind when you think of Vietnam. Junk boat tours are very popular here, as well as kayaking and exploring Cát Bà National Park. While you’re in Hội An, you can stroll over the Japanese Covered Bridge or visit the Cam Nam Village – just a short boat, skip and a jump away. If you need to squeeze in some tanning time, Hội An is a coastal town where you can enjoy a gentle pace. Later, flex your culinary skills and learn about Vietnamese cuisine with a cooking class. There are so many highlights of Vietnam it is hard to pick one, but if I were to say the one I talk about the most now it is actually getting a suit made in Hoi An, Vietnam! This city is full of hundreds upon hundreds of tailors and is known as the place to go in the country for getting tailored clothes. Going in for sizing, adjustments, and even more adjustments over a period of several days was, shall we say, an experience and the suit has been well worn in the many years since coming home! 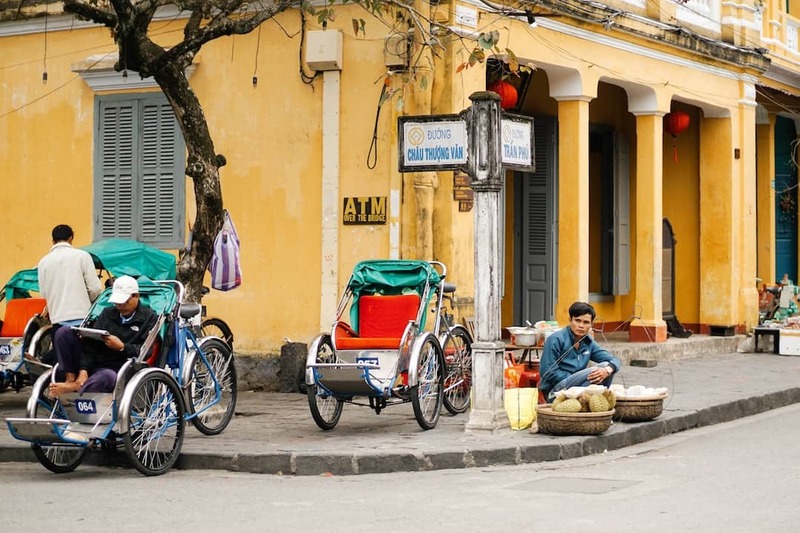 The capital of Vietnam is ideal for exploring the country’s history, from ancient temples and pagodas to colonial buildings and intriguing museums. Take it all in and explore the pagodas, the traces of French-Chinese occupation and navigate your way through the winding streets. If time allows, this is the perfect city to enjoy a cyclo ride. In Vietnam, I was fortunate enough to join a bicycle tour that rode partly from Hanoi all the way to Saigon. For me the highlight was riding through tiny villages along the way and meeting locals and eating local foods. I loved seeing the happy, smiling kids who came out to wave at us as we passed. My favorite areas in Vietnam are SaPa and Dalat — a bit off the beaten path and both beautiful! Hue is fascinating as the seat of the Nguyen Dynasty emperors and the national capital from 1802 to 1945. Many royal tombs lie here, and a huge attraction is the Imperial Enclosure, which is surrounded by a moat and was subjected to significant damage in previous wars. This is the bustling, skyscraper-filled part of Vietnam, which has everything you could ever wish for. You’ll find a lot of French influences here, like the Notre-Dame Cathedral, and local museums. 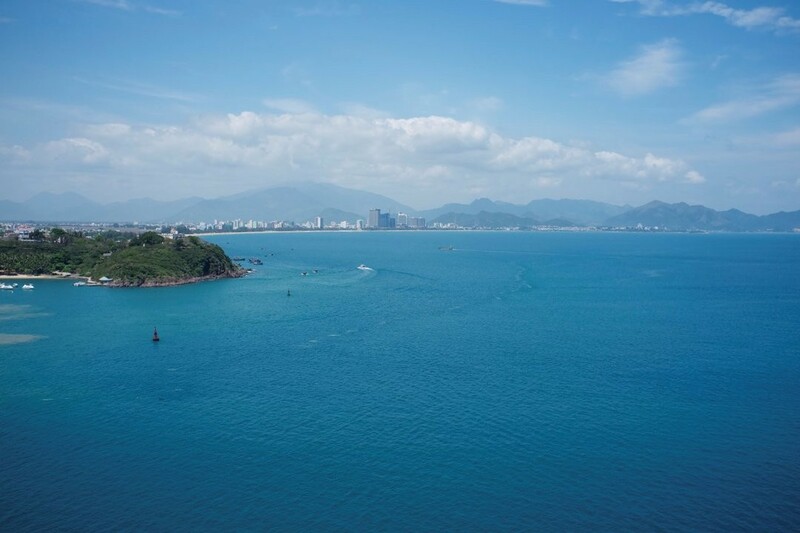 Vietnam’s most famous and energetic beach resort town, Nha Trang has a beautiful backdrop of rolling hills and features a paradisiacal bay with stunning islands. Explore the coral reefs of Hòn Mun and Hòn Tằm islands or simply relax on the beach, cocktail in hand. 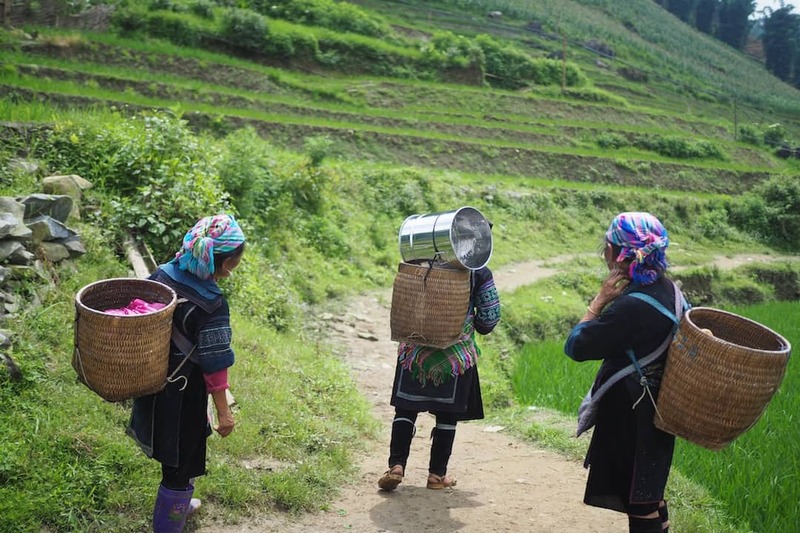 In northwestern Vietnam, you’ll find Sapa, a mountainous town spilling with culture and overlooking terraced rice fields. Hill tribes make up most of the population here, while tourists use this old French Hill Station as a base for treks. Our trek into Sapa where we trekked through the Hoang Lien Son Mountains was by far one of the greatest experiences in Vietnam. Each day felt like we were walking through a National Geographic photo essay as rice terraces soaked with water reflected the sun high in the mountains. It was one of the most beautiful places we’d ever seen.